Turn up the heat on your jewelry making with this exclusive kit including enamel how-to resources and sample pack! Light up your inspiration with this kit that includes how-to information AND enamel! 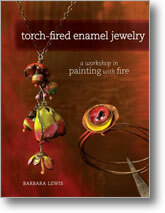 Conquer torch-fired enameling with this exclusive kit! 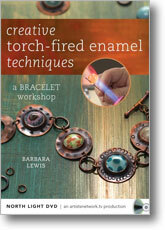 With three must-have technique resources, you will learn the basics of the technique, including layering colors, proper application, enameling beads and other metal findings, creating burnt edges, and so much more! Join Barbara Lewis and Pauline Warg as you explore the possibilities of this technique. Then, put the information to use with an exclusive enamel sampler pack! Hand-picked by artist Pauline Warg, you'll get a 10-color sample pack (1tsp quantity of each color), sifter, copper discs, trivet, silver foil, and Pauline's scrolling tool. 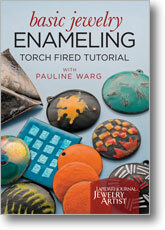 Start creating beautiful enameled jewelry today! 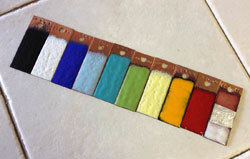 Take a look and see just what you'll get with this ultimate Enameling kit! Hurry! Stock is limited on this HOT kit! *Not all items are shown in photo. 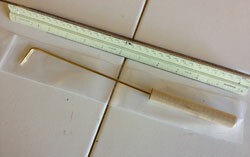 Kit also 1 include trivet, 3 copper discs, 1 sifter, and 1 small square of Pure silver foil.